There are currently 95,339 users on this website. US$1,650 delivered to the US; international shipping available - please contact me for a quote. 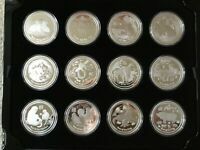 This listing is for a complete collection of 12 2 oz silver proof Lunar Year coins as issued by the Perth Mint in Australia. Each coin comes with its own certificate of authenticity. Please note that only the first 6 coins have matching CoA numbers. The coins come in a heavy(!) box with an outer cardboard box. This is an official release from the Perth Mint which was made exclusively for a German authorized distributor of the Perth Mint. Only 1,000 of these sets were issued and quite a few were broken up to sell the coins individually. Hence, there are fewer than 1,000 remaining. Newly listed items on eBay by omxfl. View all omxfl's items on eBay.